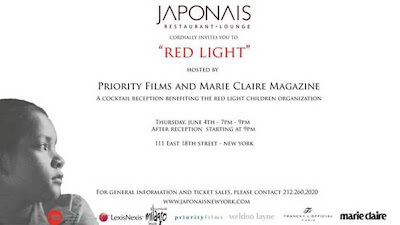 Join us at this red carpet, high profile cocktail event, featuring Japonais’ signature dishes, open bar from William Grant Portfolio, and entertainment provided by Dj Serg. Francky L’Official will style the Geisha hostesses with additional clothing and makeup design by Welden Layne and Vincent Oquendo from Artists by Next Agency. Tickets at $40 in advance, $50 at the door. VIP tickets including table service and gift bags $250. All tickets include Japonais’ signature hors d’oeuvres and open bar from William Grant selection, 7-9PM. Proceeds benefit the RedLight Children Campaign, a non-affiliated 501(c)3 organization targeting all forms of child sexual exploitation, human trafficking, and slavery. For more information please visit www.redlightchildren.org. In conjunction with an extensive awareness and education campaign, RedLight Children works to create and implement more effective programs to decrease modern day slavery. Child sexual exploitation is a global epidemic affecting over 2 million children worldwide. In the United States nearly 500,000 children, some younger than 10 years old, are being forced to work into the world of prostitution. Most recently, the US State Department and Condoleezza Rice recognized RedLight Children for their work combating global human rights violations, awarding founder Guy Jacobson and RedLight Children the prestigious Global Hero anti-trafficking award.